The battles heat up with new Races and Classes! Never put a Dark Elf and an Orc in the same room. That is, unless you're playing Epic PvP: Fantasy! 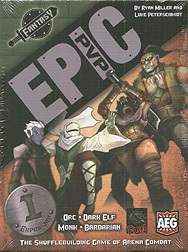 With this expansion, you can add the devious Dark Elf and the easily peeved Orc races to your games of Epic PvP: Fantasy as well as the disciplined Monk and the brutal Barbarian classes. These new and unique decks are fully compatible with all previous Epic PvP: Fantasy decks, allowing for some powerful (and sometimes ridiculous) new character combinations. Get back in the arena, THE BATTLE IS ON!